Explains and describes the ways that language use in the legal system can create inequality and disadvantage. 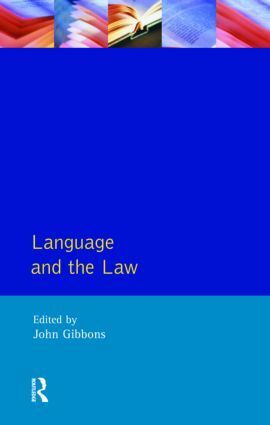 It examines the three main areas where the two intersect: the central issue of the language of the law; the disadvantage which language can impose before the law, and forensic linguistics - the use of linguistic evidence in legal processes. Each section of the book is preceded by an introduction by the editor which sets the paper within a conceptual framework. Lawyer's opinions are not neglected even though the collection is written mainly by linguists. The section concludes with a lawyer's response, in which a prominent lawyer with a particular interest in the content of the section responds to the papers.